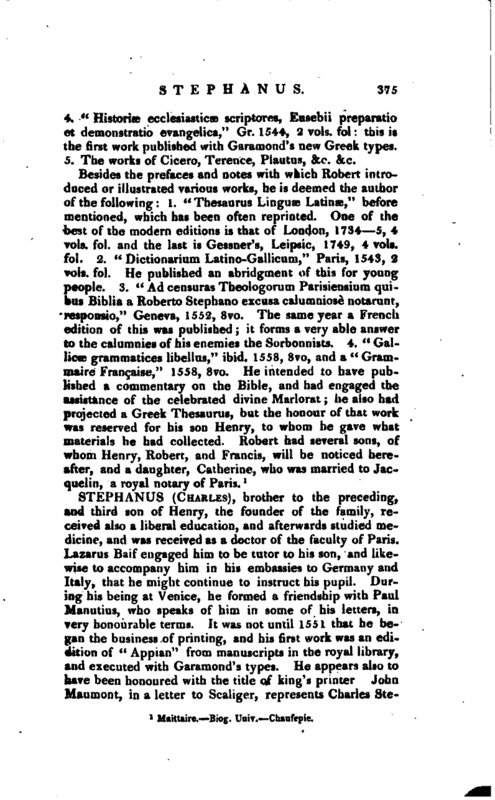 , brother to the preceding, and third son of Henry, the founder of the family, received also a liberal education, and afterwards studied medicine, and was received as a doctor of the faculty of Paris. 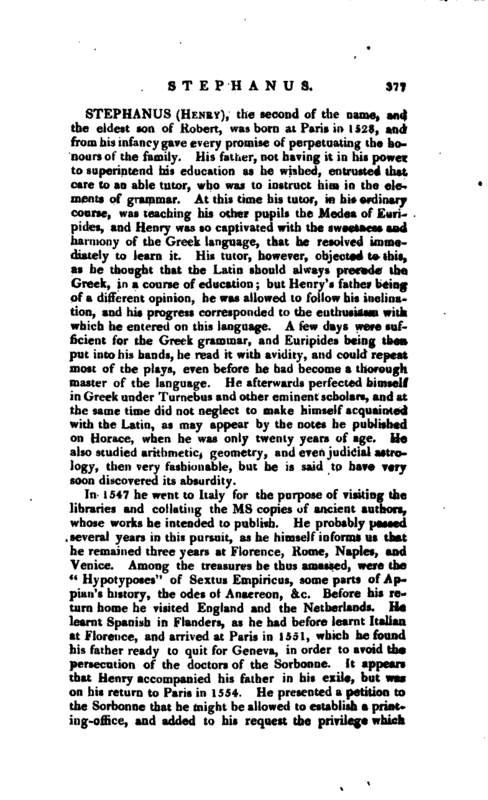 Lazarus Baif engaged him to be tutor to his son. >nrJ likewise to accompany him in his embassies to Germany and Italy, that he might continue to instruct his pupil. During his being at Venice, he formed a friendship wit a Pnul Manutius, who speaks of him in some of his letters, in very honourable terms. It was not until 1551 that he began the business of printing, and his rirst w>rk was an edidition of “Appian” from manuscripts in the royal iib r ary, and executed with Garamond’s types. He appears also to have been honoured with the 'itle of king’s printer John Maumont, in a letter to Scaliger, represents Charles | Stephens as an avaricious man, jealous of his brethren and even of his nephews, whom he endeavoured to injure on every occasion. He was, however, unsuccessful in business, and was imprisoned for debt in the Chatelet in 1561, and died there in 1564. 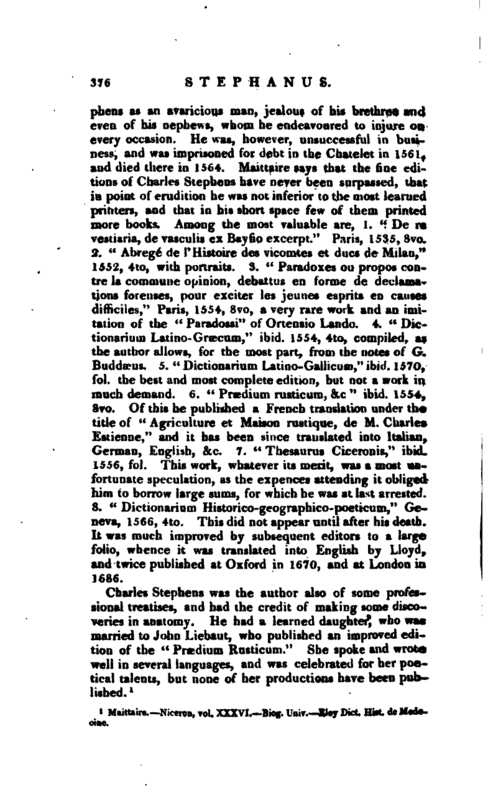 Maittaire says that the fine editions of Charlt-s Stephens have never been surpassed, that in point of erudition he was not inferior to the most learned printers, and that in his short space few of them printed more books. Among the most valuable are, 1. “De re vesiiaria, de vasculis ex Bayfio excerpt.” Paris, 1535, 8vo. 2. “Abrege de l’Histoire des vicomtes et dues de Milan,” 1552, 4to, with portraits. 3. “Paradoxes ou propos contre la commune opinion, debattus en forme de declamations forenses, pour exciter les jeunes esprits en causes difficiles,” Paris, 155 4-, 8vo, a very rare work and an imitation of the “Paradossi” of Ortensio Lando. 4. “Dictionarium Latino-Graecum,” ibid. 1554, 4to, compiled, as the author allows, for the most part, from the notes of G. Buddseus. 5. “Dictionarium Latino-Galhcum,” ibid. 1570, fol. the best and most complete edition, but not a work in much demand. 6. “Preedium rusticum, &c.” ibid. 1554, 8vo. Of this he published a French translation under the title of “Agriculture et Maison rusti^ue, de M. Charles Estienne,” and it has been since translated into Italian, German, English, &c. 7. “Thesaurus Ciceronis,” ibid. 1556, fol. This work, whatever its merit, was a most unfortunate speculation, as the expences attending it obliged him to borrow large sums, for which he was at last arrested. 8. “Dictionarium Historico-geographico-poeticum,” Geneva, 1566, 4to. This did not appear until after his death. It was much improved by subsequent editors to a large folio, whence it was translated into English by Lloyd, and twice published at Oxford in 1670, and at London in 1686. Maittaire. —Niceron, vol. XXXVI. Biog. Univ —Eloy —Dict. Hist. de Medeoine.